There are so many fun crochet patterns for spring. 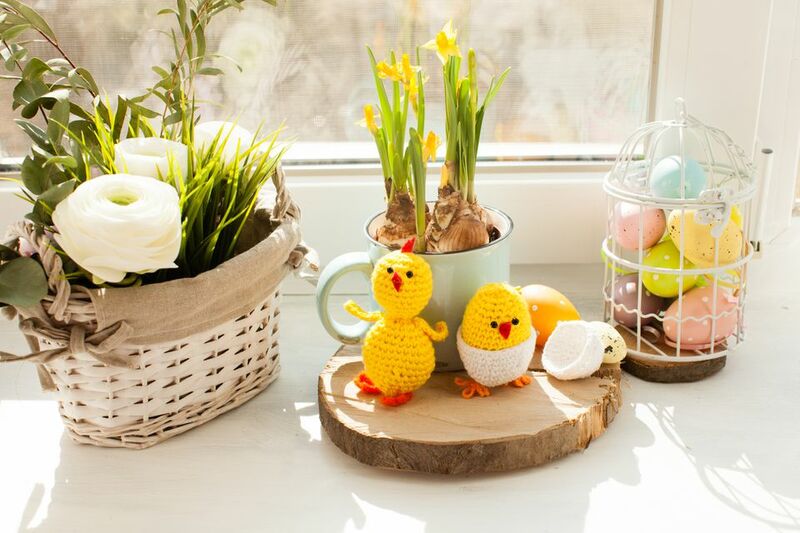 Holiday crafting includes Easter crochet and crochet for Mother's Day. Spring is also the perfect time to crochet warm weather accessories to wear through the summer. Embrace pastel colors and sunny bold hues. And don't forget to add spring flowers to everything! Get your bicycle out to enjoy the spring weather! Make it more creative and colorful with a crochet bike seat cover. If you are looking for something new to try, consider making crochet jewelry. Earrings like these adorned with birds can accessorize any spring outfit. As the weather warms up for spring, we are more likely to eat fresh fruit. It is always fun to crochet fruit and vegetables. This smiling amigurumi lemon is just one example. Of course, you don't have to give up sweets during the spring. Go calorie-free with this crochet cake to decorate your kitchen table. The flowers and pastel colors make it a perfect spring crochet pattern. Filet crochet patterns use spaces to create designs, creating airy accessories that are ideal for spring. This crochet scarf has colors that also reflect the beauty of the season. Pineapple crochet motif patterns are openwork designs that create perfect lightweight accessories for spring. This circle shawl is a stunning example of how beautiful this motif can be. You'll want to wear it all spring long. Colorful mandalas are yet another way to brighten up your home for spring. Use them as placemats, floor rugs or wall art. This free crochet pattern is available as a Ravelry download. This shade of robin's egg blue is eye-catching. It also happens to be perfect for spring crochet patterns. You could use it for so many different things, but it works especially well for this crochet clutch purse. Dress up your home for spring with a new set of crochet curtains. These bold neon flowers are perfect for bringing the brightness of the season into your kitchen. Alternatively, you can create your own curtain design using different types of crochet flowers. If you want to add some spring decor to your home but you don't want to crochet full curtains, why not make some cute crochet curtain tie-backs instead? These are designed with butterflies, the perfect symbol for spring! Once the winter weather clears and spring's sun starts to shine, we all want to head outdoors. Picnics are a popular choice. This crochet pattern offers a "picnic on the go" option to easily keep your utensils wrapped up in a portable placemat. Don't forget to take a bottle of wine with you on your spring picnics. Wrap it up in this lace cozy to keep it safe. Keep your hands free to play music or pick flowers at any spring gathering by encasing your drink glass in this lanyard. This one is perfect for outdoor festivals! Dress up your bike with a crochet skirt guard. This one uses a lacy pineapple motif pattern with an effeminate touch. Feel flirty this spring in a new crochet skirt. This free crochet pattern has a fun chevron design in great colors! This crochet dress pattern is short and sweet, with a graphic design created from strategic spacing in the crochet. The bell sleeves make it a perfect choice for spring music festivals! Use this tutorial to learn how to take an old t-shirt and upcycle it with crochet to create a children's dress. Use the easy but elegant crochet Lover's Knot to create this simple spring necklace. It is accented with pearl spring beads. This crochet leaves pattern could be used as a garland to decorate your home or as a necklace for spring accessorizing. Don't forget that spring is also the time for spring cleaning. Make it more fun by making crochet cleaning supplies like these star stitch crochet washcloths. Get everything in your home organized with crochet baskets. This one is also a good choice for a crochet Easter basket. This free crochet tutorial shows you how to take a pair of flip flop soles and upcycle them into spring sandals. The tutorial includes video instructions as well as a written pattern. Melody's Makings has a terrific set of spring crochet accessories that can be worn together or in mix-and-match fashion. The set includes a purse, headband, belt, and bracelet cuff. The designs come in both knit and crochet patterns. This spring crochet shawl pattern is made using a single skein of Lion Brand mandala yarn. The colors are perfectly designed for a springtime accessory. It's an easy crochet pattern made with single crochet and double crochet stitches. However, it comes with a video tutorial, so even if you're a beginner, you should enough help to complete the pattern without a problem. 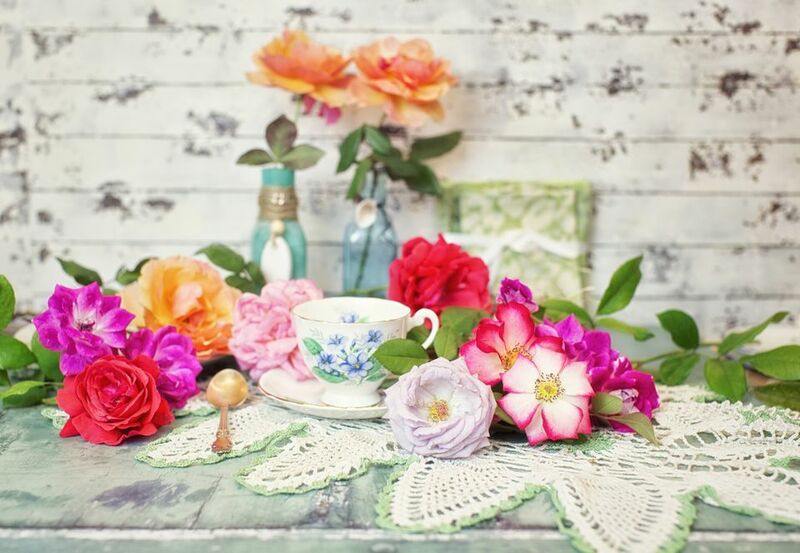 Make these cute crochet flowers and use them for almost any spring crochet project. Attach them to bobby pins or hair clips, as shown in the tutorial, and you've got the perfect springtime hair accessory. These are simpler, sweeter, and less cliche than flower crowns but have all of that same beauty and whimsy.